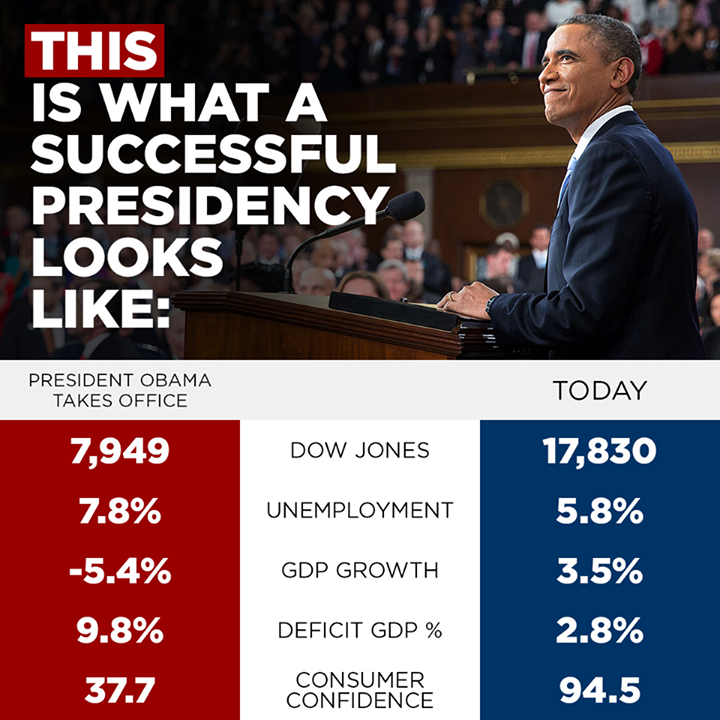 Obama’s presidency is a success, by the GOP’s favorite numbers. An old friend on Facebook told me he wants verification of the numbers, because he doesn’t feel it. Few of us below the very, very rich feel it — which is what Obama’s been saying, and what Sen. Bernie Sanders, Sen. Elizabeth Warren, Paul Krugman and Robert Reich have been saying in various ways daily. That’s what the struggle on income inequality is all about. But the numbers check out. Go see for yourself (some of the sites I list below update monthly, or daily, so if you’re not looking at this in December 2014, they may vary; look for the link to historic numbers). Numbers are dated in Consumer Confidence (but much higher than I thought! See below). But the other numbers are well published. Dow Jones Index plugged at least nightly on NBC, ABC, CBS and PBS — hourly at least on CNN and MSNBC (I don’t get the latter two). 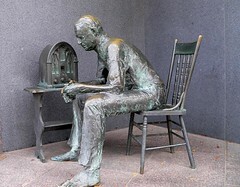 Unemployment is updated monthly by the Bureau of Labor Statistics — and again, plugged on national news when it happens. As a socialist anti-free market guy, Obama is the worst in history. Now will you listen to Obama when he tells you that we need to do something OTHER than what the GOP says, to make the growth something YOU feel? Please? So tomorrow, and every day until January 21, 2017, when your very conservative and otherwise not stupid friends tell you we must “cut government” because “America can’t afford to be great any longer,” instead of flipping them the bird like you usually do, send them here to get the links to look at the numbers for themselves. Don’t take my word for it, nor the DCCC’s word for it. Look for yourself, using the sites I’ve listed above. Now ask: Why can’t Congress figure this out, and give Obama some support? Kansas finds itself in a big, big pickle. Republican Governor Sam Brownback managed to get the legislature to make massive tax cuts, claiming it would boost jobs in Kansas and stimulate the Kansas economy, thereby paying for themselves. Instead the Kansas economy is failing. Massive cuts have gutted Kansas’s once-revered public education system, and deeper cuts will be necessary to keep the state government afloat, unless there is some change in tax policy, or a massive, miraculous influx of business beyond what even the Koch Bros. could arrange. Gov. Brownback is running for re-election, and finds himself behind in popularity in Kansas — behind even President Barack Obama. And of course, there is comedy of the kind that you couldn’t make up: Brownback blames Obama. Chart from Vox, showing what happened to Kansas’s surplus revenues, promised to balloon with the tax cuts Gov. 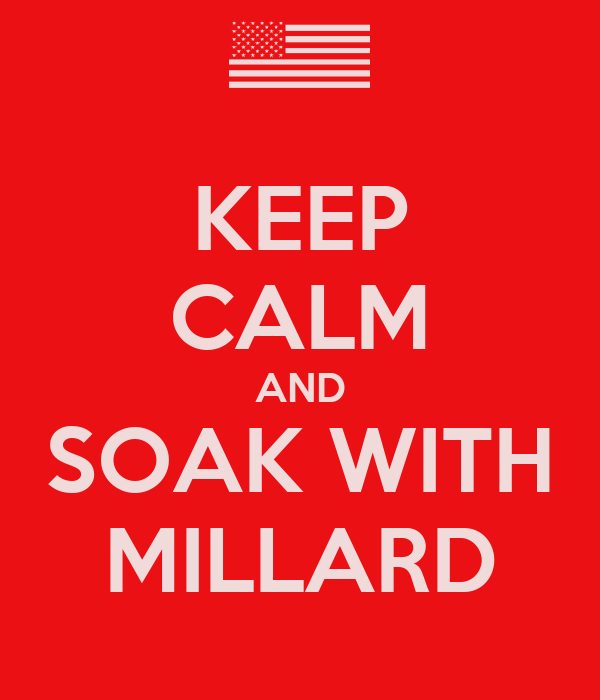 Brownback asked for, and got. Turns out Americans, and especially the citizens of Kansas, want government that works. They’d like taxes to be low, but low taxes won’t make voters happy when the roads are bad and the kids’ schools are crappy. 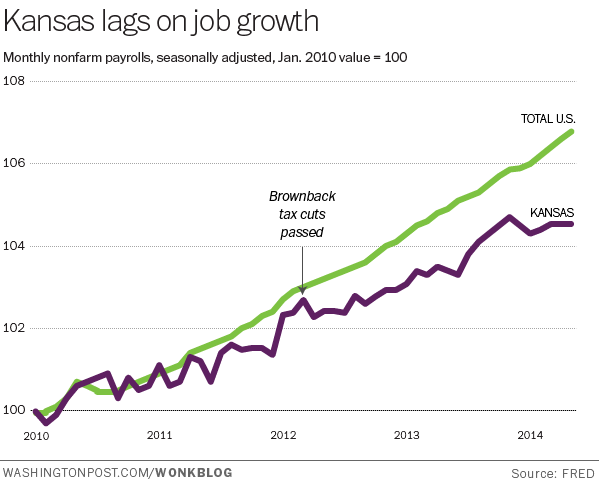 Wonkblog’s chart showing job creation in Kansas is lagging, also, contrary to the GOP promises when tax cuts were instituted. Government’s first job is to govern; just governments are established among men to secure human rights, old Tom Jefferson wrote. Life, liberty and pursuit of happiness make a snappy line in a patriotic reading on July 4, but when the crowd drives home, they don’t want to be dodging potholes, and they don’t want their kids to complain from the back seat of the car that they don’t know what the Declaration of Independence is or what it says, “and who is Jefferson — I thought it was just a street in Dallas?” When government fails to do basic jobs, voters may not be happy. 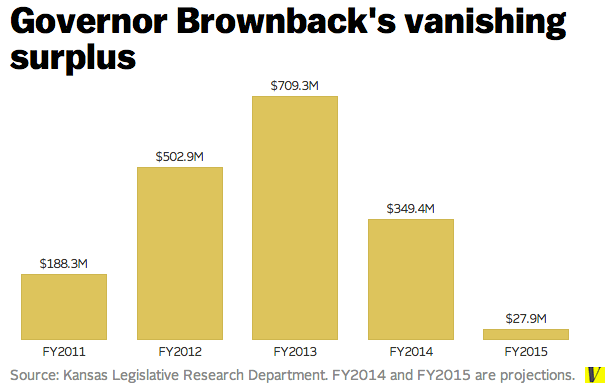 Will false advertising be able to bail Sam Brownback out? Watch Kansas. Hey, Congress! Fix the roads! Just a crazy idea, I know: But do you think Congress could pass a bill to help the states fix potholes in federal highways, make the thousands of decrepit bridges, safe, and put a few thousands of people to work? ONLY the drunk, they say, drive in a straight line in Chicago. The sober zigzag to avoid falling into the city’s axle-breaking potholes. This year the craters, caused by continual freezing and thawing, are worse than ever, and the spring thaw has brought three times the usual number of complaints from citizens. As winter retreats, holes in roads and budgets are being revealed—especially in midwestern states, which were hit hard by the polar vortex. Those states with money have made emergency appropriations for repairs; those without will have to cut summer programmes. This means not mowing the grass in parks or picking up litter. It also means delaying resurfacing of highways or fixing guard rails, and putting off capital spending. Looking after America’s roads is a persistent headache. Although $91 billion is spent on them every year, that is nowhere near enough to keep the country’s 4.1m miles (6.6m km) of public roadways in good nick. The Federal Highway Administration estimates that $170 billion in capital investment is needed every year. Last year a report from a civil-engineering group said that 32% of America’s major roads were in poor or mediocre condition. Main roads through cities were in worst shape: almost half the miles travelled over urban interstates in 2013 were a bumpy ride. Ray LaHood, a former transport secretary, thinks the roads are probably in the worst shape they have ever been. Is it too big a stretch to go back to the hopes in 2009, that we might get a jobs bill to fix this stuff? Yeah, it’s 2014 — and the roads, and the American people, need a jobs bill more than ever. As so often the case, Bill Moyers finds THE expert, who has the real answers. Hint: Cutting deficits now could bring economic disaster; Paul Krugman carefully and clearly explains why. 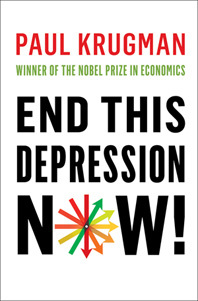 Cover of Paul Krugman’s book, End This Depression Now! Nobel Prize-winning economist and New York Times columnist Paul Krugman explains why our top priority should be getting America back to work – if only Congress and the President would stop throwing distractions in the way. He also details the catastrophic impact the economic downturn continues to have on average Americans, as well as avenues of hope and recovery. Krugman’s latest book, End This Depression Now!, is both a warning of the fiscal perils ahead and a prescription to safely avoid them. Yeah, yeah, I know — this thing is 47 minutes long! Watch ten minutes now, and come back to it. It’s only the fate of our nation, and the planet, that rides on this information. Nobel Prize-winning economist and New York Times columnist Paul Krugman argues that saving money is not the path to economic recovery. Instead, he tells Bill, we should put aside our excessive focus on the deficit, try to overcome political recalcitrance, and spend money to put America back to work. Krugman offers specific solutions to not only end what he calls a “vast, unnecessary catastrophe,” but to do it more quickly than some imagine possible. His latest book, End This Depression Now!, is both a warning of the fiscal perils ahead and a prescription to safely avoid them. “I probably have more influence doing what I do now than I would if I were inside trying to do the court power games that come with any White House, which I don’t think I’d be any good at… What the president needs right now is he needs a hard-nosed negotiator. 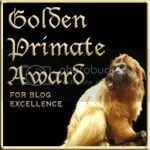 And rumor has it that’s what he’s got.” Watch this clip. “We have pretty good evidence on how long does it take to make up for the fact that you happen to graduate from college into a bad labor market. And the answer is forever… You’ll miss years getting onto the career ladder. By the time you get a chance to get a job that makes any sense, you know, that makes any use of your skills, you will already be tarred as somebody, ‘Well, you’re 28 years old and you haven’t held a responsible position?’ ‘Well, yeah, I couldn’t because there were no jobs.’ It just shadows your whole life. And it’s very clear in the evidence from past recessions, which have been nowhere near as bad as this one.” Watch this clip. 12 million jobs — but not until when? It’s extraordinary to consider with just three weeks until Election Day, but Mitt Romney’s central argument to voters has been exposed as a total fraud. Obama’s budget NOW creates 12 million jobs in the next four years, according to projections. Romney? He stretches it out to ten years, but reduces the job creation, so it’s 2.5 times as long to get the same number of jobs. Say what? Romney’s plan reduces the number of jobs created by cutting the rate at which they are created. The Sacramento Bee, one of America’s great newspapers which we hope can stay in business through these tough times, today put up a map of California unemployment, county by county. The map shows unemployment changes over the past year with an interactive slide that makes it great for classroom use in economics, but makes it impossible for me to embed here (it’s in Adobe Flash). California economics classes can use their knowledge of agriculture and industry in the state to make educated guesses about what is going on in each county. Surely there are uses the rest of us can find. Colusa and Imperial Counties are two of the hardest hit — with the internet, can your students tell what that is going to mean for prices on fresh produce and processed foods? 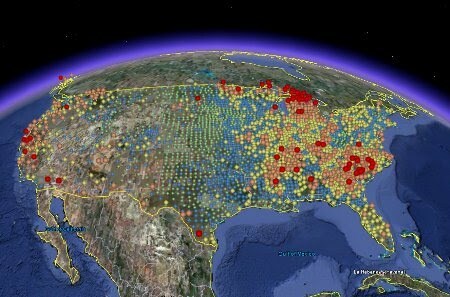 This is where computers and the internet step out ahead in the education tilts, with tools like this interactive map. Thank you, SacBee. Can you give teachers a download?